Masaki Taniguchi tells me he was on a train in Japan recently when he got talking, mostly in English, to a Swiss lady who was touring Japan with her family. She was from Lausanne and her first language was French. She mentioned that she loved sushi. 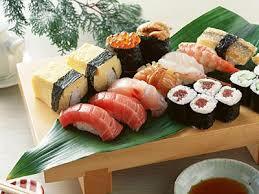 Sushi comes in many varieties. While westerners usually like most of them, not everyone is enthusiastic about those that include uncooked fish. Masaki said to the Swiss lady “Do you like raw fish?”. Her unexpected reply was “Oh, you speak German?”. This reminds me of a more complicated multilingual example, probably apocryphal. A visiting Frenchman in Enɡland went to buy an ice cream. The vendor asked him what size he wanted. The Frenchman understood the question but answered in French, “à deux boules” (with two scoops) a dø bul. Fortunately communication was not impaired, despite the interlocutors’ ignorance of one another’s language, because the English vendor heard it as “a double” ə dʌbɫ. This reminds me of asking a Danish lady how to pronounce "God dag" (Good day). I was surprised at the answer, because it sounded so similar to English "Good day". In fact, it sounded very like Australian "G'day". I once saw a movie in Swedish with English subtitles. At one point a man his standing on his balcony and sees his friends in the street below. They called to him, "Kan vi komm' upp?" (eliding the final a of "komma" before a vowel), and I didn't need the subtitles to understand that! "What a handsome face" sounds like "var det han som fes?" ('did he fart?') in the dialect of Skåne. I was once complimented on my German, which I don't speak. I had said a single word in English, rather softly, and it had been taken as the German equivalent. The word was 'twelve'. In a German university library, I was once asked by an elderly woman, struggling with the computer catalogue whether I could help her. I answered "Wie?" (German for "how?") and she mumbled something like "oh, vous êtes Français, pardon" and walked away. I once walked up to a grass tea shop in Swatow (Teochew-speaking city) and asked for a glass of coa-ci-chau tea (snake's tongue grass tea). I was speaking Holo-Hokkien using Amoy/Old Taibei pronunciations, because I find that Teochew speakers have an easier time understanding these. When the lady handed me my tea, she started talking to me in rapid Teochew. I didn't understand her. Surprised, she said, "Wait, so what language were you speaking just now?" ... Then there's numbers in the Philippines. Since I speak Spanish, as long as I stick to the numbers, Filipinos don't seem to suspect that I don't speak their languages. I once had met this Italian guy, that spoke nothing but Italian, I tried to communicate in English with no luck so I had to try my rusted Spanish and it worked quite well.